In the early days of bitcoin, what could you buy? Guns, drugs — yes, bitcoin’s general reputation was very poor since its anonymity was useful when buying suspect products on blackmarket sites like Silk Road. But what if I’m just in need of some cosy socks? Is there something out there for me? Oh absolutely. Alpaca wool is perfect for socks — it’s extremely warm and hypoallergenic to boot. As luck would have it, one of the first businesses to accept bitcoin was Grass Hill Alpacas farm in Massachusetts, USA. David Forster persuaded his parents who ran the farm to let him sell their alpaca socks in exchange for bitcoin. Despite telling him they thought it was a “Ponzi scheme”, the experiment certainly seemed to boost his parents’ business. Back in April 2013, David reported that bitcoin sales made up a third of their stock last year, with customer requests from around the world: “It makes international transactions as easy as interacting with your neighbour”. However, even then bitcoin was undergoing massive price fluctuations. He began in 2011 by charging 75 bitcoin for each pair of socks, but had to lower the price to 5 by June owing to huge growth in bitcoin’s value. Though an update in June 2016 suggested that the store would be reopening, all the alpaca socks are today showing as out of stock. 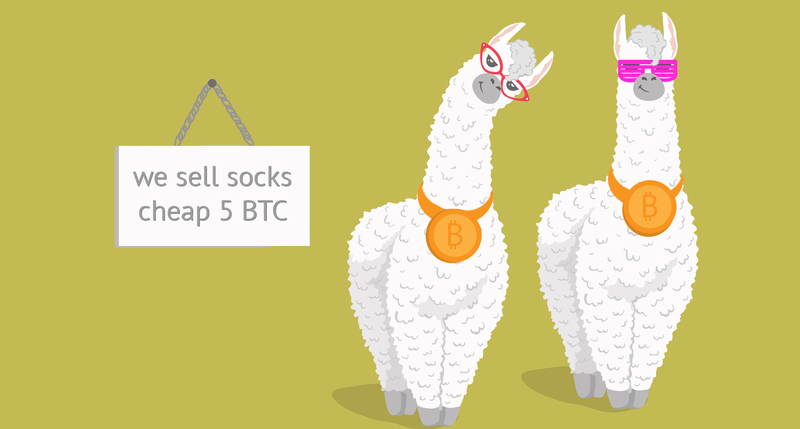 It’s a shame, as the availability of alpaca socks caught the imagination of bitcoin’s early adopters. The world of cryptos has moved on and a number of large retailers now accept bitcoin online. Microsoft allows you to buy apps, you can book your flights and hotel with bitcoin through Expedia, and — if you happen to have done really well out of the latest price boom — why not try a flight into space with Virgin Galactic? Of course, price fluctuations are still an issue that make it difficult for people to currently use bitcoin or other cryptocurrency as a medium of exchange, rather than an asset to sit on. As an example, back in December 2017, 5 bitcoin was being exchanged for around $100,000. That’s the most expensive pair of socks I’ve heard of (yes, even beating these). Sadly, it seems like David didn’t hang onto the bitcoin. Perhaps if he had, Grass Hill Alpacas farm would have had some very happy critters. We find the interesting truths behind new technologies. We de-jargon what it does and explore why it matters. Stories make tech real.